POSH PREVIEW: It’s a clash between the two worst teams (currently) in League One! Rival managers Graham Westley (left) and Darren Ferguson before Posh beat Doncaster 4-0 at the ABAX Stadium in October. Photo: Joe Dent/theposh.com. Peterborough United are facing the most out-of-form teams in the country on Saturday (March 19). Doncaster’s record of one point from their last eight League One matches is the worst record in the top four divisions in English football. 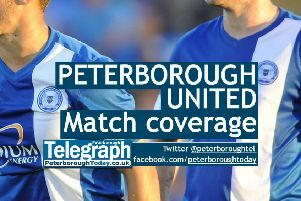 Ricardo Santos (right, pink) is available for Posh against Doncaster. Photo: Joe Dent/theposh.com. Mind you the four points Posh have picked up in the same period is bettered by 87 of the top 92 clubs! Posh and Doncaster are the bottom two teams in the League One form table based on the last eight matches. Such is the awful form of both clubs, the importance of the game, rather than another meeting with ex-Posh boss Darren Ferguson, will dominate the build-up. Ferguson, apart from a 4-0 drubbing at the ABAX Stadium in October, made a decent start to life at Doncaster, but Rovers have won just seven of 25 League One matches overall under his care. As a result Ferguson is looking over his shoulder, for personal reasons, as well as at the relegation zone. After last weekend’s (March 12) 2-1 defeat at Bradford City, Ferguson said: “In the last five years 50 points has kept you up. So that’s four wins and a draw we need. “We have several games against the teams around us in the table so we have a great chance of turning things around, but we must do it quickly. It could well go right down to the wire. A win for Rovers on Saturday would make Posh more nervous about their fate the season - the midweek results mean they are currently just eight point clear of the relegation zone. That could become a five-point gap if Posh lose and Oldham beat Rochdale at home this weekend. But Posh boss Graham Westley refuses to discuss the ‘R’ word. Westley said: “In football you are always in a battle to win the next game and to improve your league position. That’s the battle we are in at the moment. “One of our main aims now is to win matches and play well for the rest of the season and get players and fans itching for next season. “Every game is important in that respect. “There are so many connotations about Saturday’s game. Two ex-Preston managers and one ex-Posh manager are involved, but there will be no special plans from us. Posh central defender Ricardo Santos is available again after completing a two-match suspension for his second red card of the season at Bury on March 1. Wins in 2016: Doncaster 1, Posh 2. Home wins in 2016: Doncaster 0, Posh 0. Last win: Doncaster Jan 2, Posh Feb 6. Current run: Doncaster 8 defeats in last 9 matches, Posh six defeats in last 7 matches. Current position: Doncaster 20th, Posh 16th.